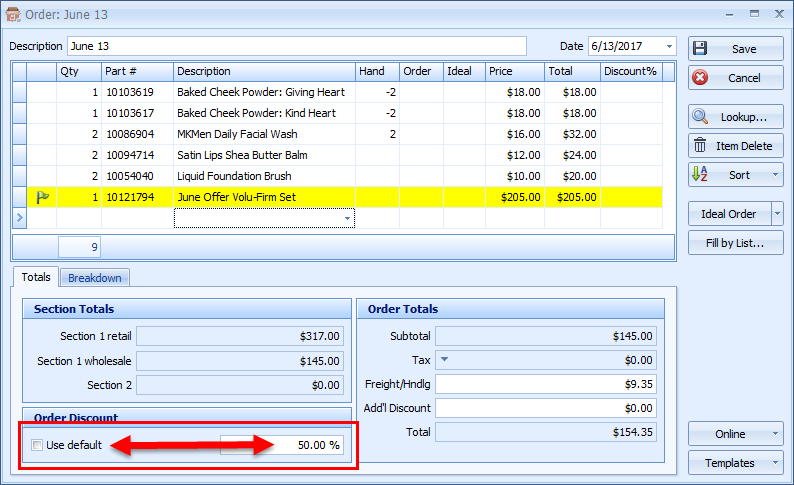 Compare your packing slip totals with the amounts shown in Boulevard under the Totals tab. Use the Breakdown tab as an additional resource to view the default discount on the order, any items purchased that are not eligible for discounts (such as purchase with purchase items), along with Other discounts given. * Depending on your country or the warehouse your order was shipped from, your packing slip may look different, and/or use other terminology. The table and image above are shown as examples only. Are all the items accounted for? Did you set the correct Order Discount amount? Does your state charge tax on shipping? Select Add tax for freight. Did you order any items that are considered non-taxable where you live? 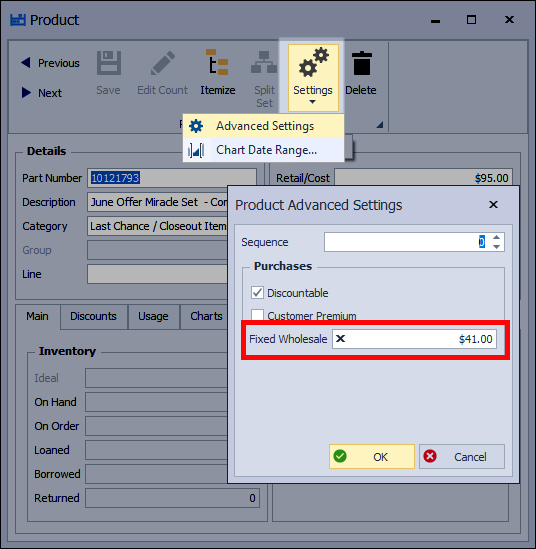 Or does the item need to be set as Discountable or Non-Discountable? 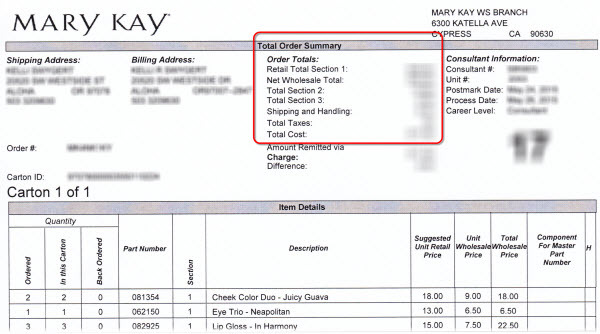 Items highlighted in magenta and marked with a are either non-taxable or non-discountable. From the Shortcuts form, click Find Product . Double-click on the item to open the product profile. Under the Pricing section, uncheck the Taxable check box. From the product profile tool bar click , then select Advanced Settings from the drop-down options. 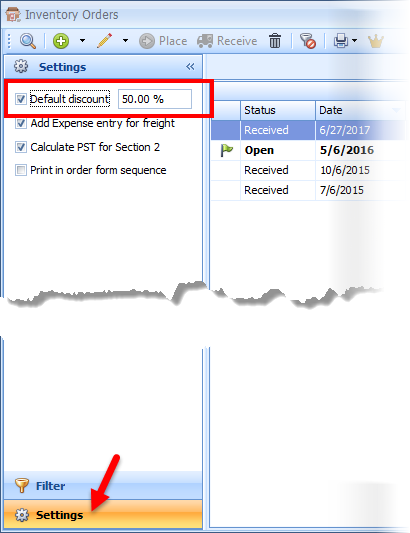 Select to mark whether the item needs to Discountable or not. View Over-the-Counter Drug Products article to view all items marked as an OTC product. Were there any items that have a fixed wholesale amount? 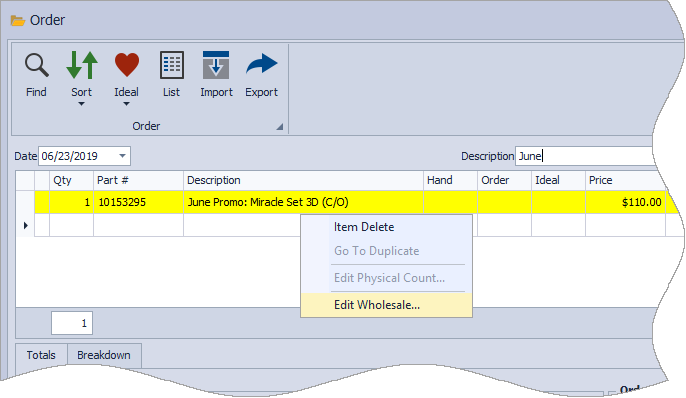 If an item ordered has a fixed wholesale cost the row will be highlighted in yellow and indicated with . Right-click on the applicable item, and select Edit Wholesale. Enter the fixed wholesale amount charged. Items can be set to permanently enter a fixed wholesale amount to handle situations such as purchase-with-purchase, etc. Enter the applicable amount in the Fixed Wholesale field. Did you order any Prepacks? 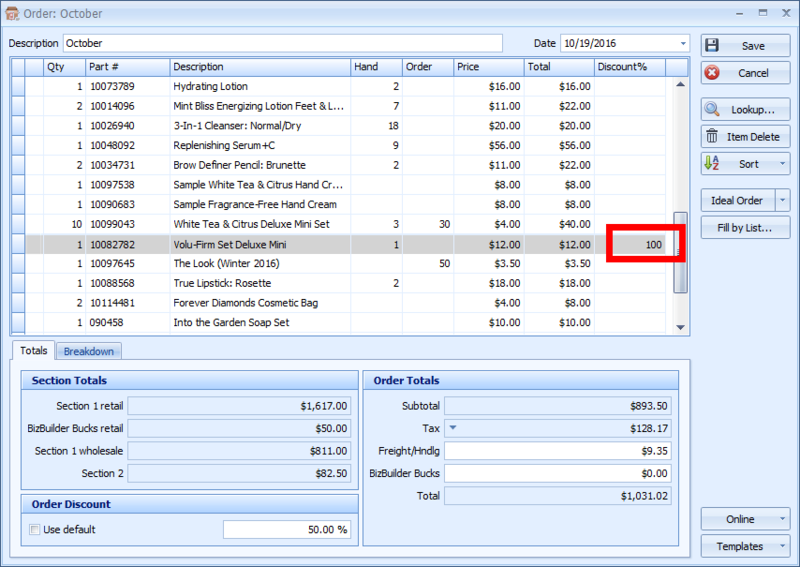 If an item ordered is a prepack the row will be highlighted in yellow and indicated with . Locate the item, then right-click, and select Edit Wholesale. After making the necessary adjustment click OK to accept and close the form. Did you receive any Free or Bonus items? When you receive a Section 1 retail item for free as a bonus, you must add it to the order and enter 100 in the Discount column for that free item. Were there any items that had Price Changes? Items purchased on Pink Sale where the retail amount has been reduced, or importing an order after prices have changed, are very common occurrences. If there are any items with a price that is different in Boulevard, and you have confirmed that all applicable product updates have been loaded (if you load an update before the order form goes into effect, there could be price variances that you will need to make note of), you may need to adjust the amount in the Price column of the order. Biz Builder Bucks need to be accounted for differently than the rest of the order. The Biz Builder Bucks is an earned credit to be used on a future order. When issued, the credit will be added to your packing slip's Section 1 Retail Total. 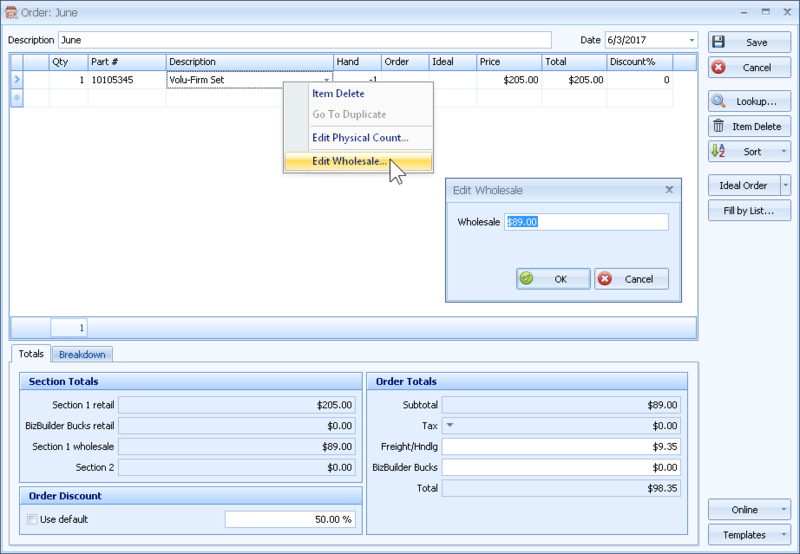 Ensure that you have not added the Biz Builder Bucks as a line item on the order itself. 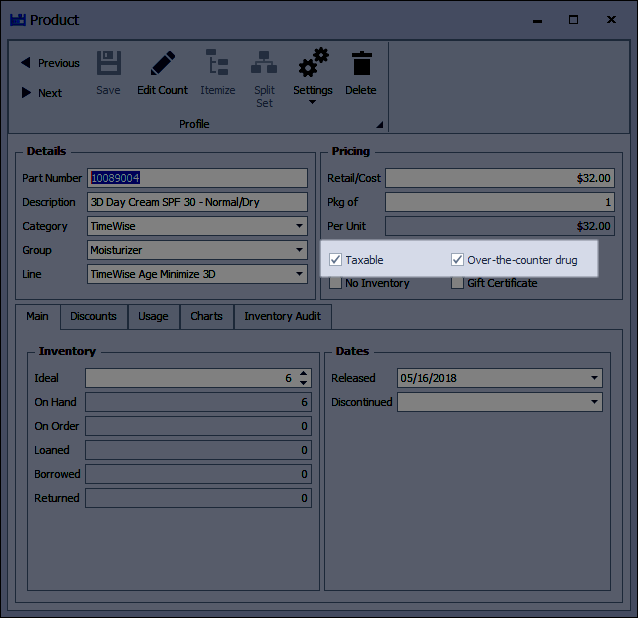 Boulevard will automatically calculate the amount earned based on the order total which will then be reflected under the Biz Builder Bucks retail field under the Totals tab of the order. 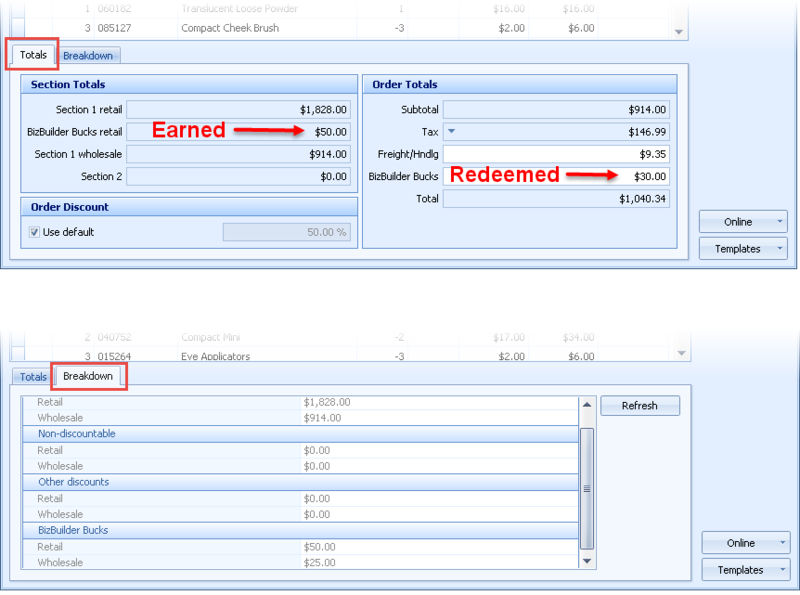 When redeeming Biz Builder bucks, add the amount to the Biz Builder Bucks field on the open order. If the order totals balance after making any necessary adjustments, proceed with marking the order as placed in Boulevard.